"These marvellously accomplished new-mint poems, as with those of his recent first collection, Anniversary, insist that ‘To try to change in the mind what happened/Is to block transfiguration.’ Certainly not for a man who knows, because he was told so by another man on a park bench in winter, as indeed how could anyone doubt, that the image the earth most closely resembles, (in fact looks exactly like), is a blob of light as reflected at night in a hare’s eye. Richard Halperin must have lodged for a time with the sea-charts in the map-room of one of Calvino’s Invisible Cities; he deals so adroitly with any possible misunderstandings between the poem as it unfolds and the strange particulars from which it is unfolding. Richard W. Halperin’s work has been widely published since 2005, especially in THE SHOp, Cyphers, Revival Literary Journal, The Stinging Fly (featured poet, summer 2009), Ambit, Carillon, The Delinquent, Obsessed with Pipework. His debut collection is Anniversary (Salmon, 2010). A Japanese version appeared in 2012 (Sakiko Tagaki, translator; Kundai Bungei-sha Press, Tokyo, 2012). Several poems have been honoured in competitions in Ireland, the U.K. and Italy, including two 2012 first-prize poems in the present book. Mr. Halperin gave his first reading at Glenstal Abbey and has since read throughout Ireland, including at the Guinness Book of Records marathon, Irish Writers’ Centre, Dublin. Prior to retirement as Chief of Section, UNESCO, he edited Reading and Writing Poetry (Paris, 2005), available gratis via the internet. He is currently working on a third collection Quiet in a Quiet House. And so does happiness, because this is happiness. And drowsiness, as if there were no towns or obligations. Their fingers, because why should the future ever come? Pushed back, all the ropes loosed and not our concern, really. Since he first had poems published in 2005, Halperin’s work has appeared in a number of publications and won him awards. He regularly reads his poems at festivals and other events. His first collection from 2010, Anniversary, has even been translated into Japanese. He draws on a wide range of sources for these poems including Irish, Russian, French and Jewish stories. His poems are complex and enchanting works which weave fantasy and reality together in order to get to deeper universal truths. He has a third collection on the way. A second collection which shows the strength and conviction of a poet who has discovered himself and is now probing the meanings of life and the vagaries of death. It is populated by ghosts. Not ghosts who rattle chains and carry their heads under their arms but those who rattle the reader’s cage of comfort with messages as telling as any given by Jacob Marley to Scrooge; messages coded in images as ordinary as strawberry jam or as pertinent as gravestone effigies. What dates or phrases could contain her? at the back of a house…. If you are looking for poetry that tells you what to think, then avoid this collection. But if you want poetry that tells you to think, then invest 12 Euros and enjoy money well spent. Halperin is neither an urban or rural poet but seeks to express emotion and to make meaning in both landscapes, exploring them through light and shade, successfully juxtaposing rural and urban. Paris is contemplated ‘at midnight’ ‘in wheaten light’ on an early Summer morning. The ‘sun a coin’ shines over Central Park. The poet is well aware of striving for effect in poetry poking fun at such effort ‘in the usual dappled light’ when he walks through a birchwood copse. The same poem expands to a wider horizon, repeating the humour ‘over there/Under a tree (not a birch)’. He imagines a reading Tolstoy, clad in white, being painted by Repin; the images coupled with the groined birches captured forever in a painting reminds him of his wedding day. All images ‘were in the book; but not the birches’ suggesting Halperin sees the eternal not in nature but in art. For all Halperin’s delicate style and the sometimes ‘twilight’ aspects of the poetry ‘tenses are baggage’ ‘flares in the night that lit our way like fireflies’ he does not shirk from slamming the reader with that sliver of steel and directness of language without which no poet can make meaning. He bides his time until the later poems in the book and then risks cliché ‘a civilisation/On the brink of stupid and avoidable destruction’; but ‘Life mashed her,’ the fate of a young girl who rejoiced, shows Halperin can control his language perfectly balancing the banal with the shocking. 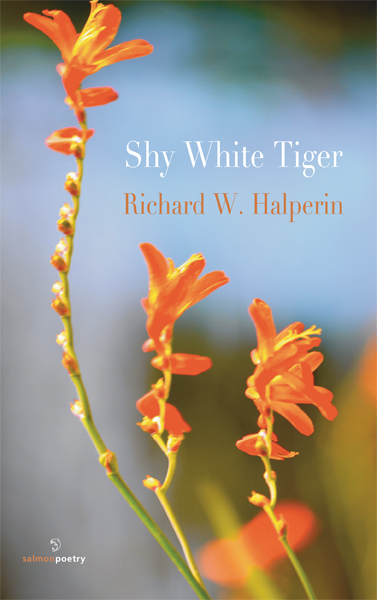 Some of the poems in Shy White Tiger deal with bereavement but Halperin does not risk expressing the finality of death until the later poems in this volume. ‘Your silver clock stopped/Tock/Silencium/Down, down, down’. The delicacy of the language is mitigated by the harsh T, D and word ‘down’ repeated thrice. The thrice repeated ‘down’ has uneasy connotations of burial and descent into the Underworld. Bereavement can bring out the sentimental and maudlin but Halperin in referring to Tydnale, first translator of the Bible in English ‘a poet strangled’ and Li Po, greatest of the Chinese poets of the Tang Dynasty, is unafraid to emulate the former’s directness and the latter’s delicacy of language. The directness seems a ‘spine’ to uphold the delicacy and unbearable poignancy of the line ‘I reach for you and you aren’t there’; the colloquial ‘aren’t’ perfectly expressing the quantum space left by the death of a loved one. Halperin mourns the death of his parents but here his verse flows more easily than in the poems on the death of his wife. There is an ease of communication with the reader, the dead and an acceptance that a parental death is a part of life for most of us. A ‘twin’ poem for father and mother each has a grain of humour ‘Dear Leo, you haven’t written in a while/but honestly, I wasn’t expecting you to’. My Mother’s Birthday, her 108th, is one the poet will celebrate by attending ‘Fellini’s Roma and a long walk home.’ Lest the reader think that Halperin regards the deaths of others than his wife as lesser grief the lines ‘my tongue vibrated/wildly like a clapper’ and ‘blew off everywhere into the wind’ belie such impression. This poet knows the agony of loss and grief. To suggest that much of the poetry in Shy White Tiger is concerned solely with bereavement is to do this collection an injustice. There is no despair here. Walking is a constant metaphor; a walking through rural and urban landscape; a walking through memory and into the future with no sense that joy is lost for the poet. From the title poem Shy White Tiger ‘someone stole his colour’ but not his soul to the last poem My Mother’s Birthday with its final line ‘the long walk home’ Halperin’s second volume of poetry is one to be treasured. His poetry can be elusive, sad, pondering without being ponderous. It is an invitation to walk with the poet who can find ‘gobs of love’ in a shared pot of strawberry jam in his walking through experience. You were upstairs folding sheets that smelled of sun. I left out on the table a tacky summer book. No one would ever press a flower into it. Or would they? Who knows what things can happen in houses? Whether it is about strawberry jam (...always on the breakfast table), or a shy white tiger (someone stole his colour / but not his dignity ), or where souls go (where does the soul go when it goes? / when one is driving, reading but not reading...) the insights and nuances offer a fresh view of our world. This is a book that will grace any bookshelf.